SPC Christopher Gathercole was killed on May 26, 2008 when his 75h Ranger unit was conducting a daytime helicopter assault on a set of buildings believed to be housing several high-target terrorists. After easily clearing the outer buildings, the Rangers reached the target building when a firefight began, during which SPC Gathercole suffered a fatal gunshot wound to the head. Early in life, Christopher was very close to his older brother, Edward, but due to extenuating family circumstances, they were separated and spent most of their childhoods in separate foster homes. After spending his early teen years separated from his family and brother, he entered a troubled stage in his life. He eventually entered a treatment house for troubled teens to start turning his life around, and although his childhood and adolescence was filled with challenges, he made the conscientious effort to graduate high school and change his life path. “He wanted to change himself, and he wanted to change the world around him,” his brother, Edward Gathercole, said. After graduating high school, Chris decided to dedicate his life to service in the Army, greatly influenced by his desire to build a better life for himself. After enlisting in the Army in October 2005, he graduated from the elite Ranger Indoctrination Program at Fort Benning, GA., on May of 2006. He was assigned to the 2ndBattalion, 75thRanger Regiment at Fort Lewis in June of 2006 where he served as a light machine gunner. His family and friends believed that his time in the Army had truly helped Chris realize the best qualities in himself, and remember him for the fun, caring individual who had a fulfilling lifetime ahead of him. SPC Gathercole’s awards and honors include the National Defense Service Medal, Army Service Ribbon, Combat Infantryman Badge, Parachutist Badge and the Ranger Tab. Additionally, he was posthumously awarded the Army Good Conduct Medal, Purple Heart, Meritorious Service Medal and Bronze Star with Valor. SPC Christopher Gathercole was 21 years old from Santa Rosa, California. 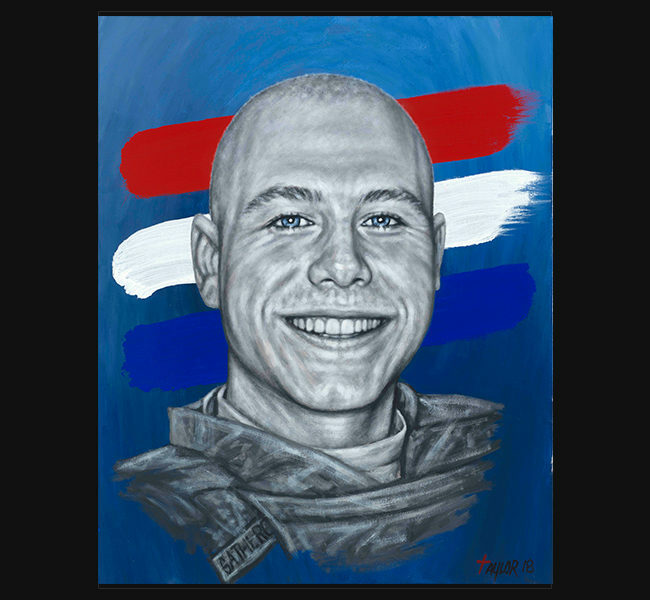 The original portrait was delivered November 11, 2018 to his brother, Edward Gathercole, and family in New York, NY during a special memorial ceremony presented by the Lead the Way Fund. Also presented was Army SGT Dale Brehm.